Whole Wheat Sourdough Starter is a Flemish-style starter made with organic whole wheat flour. It makes delicious whole grain bread. Sourdough is an ancient method of capturing wild yeast to leaven baked goods. A sourdough culture is originally created by mixing flour and water and letting it sit out for a period of time to capture wild yeast. Once established, a sourdough starter is easy to care for, can last indefinitely and can be used to make a variety of baked goods. Manufactured in a facility that processes products containing gluten. Vegan, Non-GMO. Activate using whole wheat flour and unchlorinated, unfluoridated water. Shelf life: Room temperature: 12 months, refrigeration: 12 months. 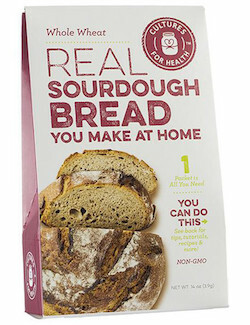 Ingredients: Organic whole wheat flour, live active cultures.